One of the main reasons that people are probably interested in purchasing a bump butter is because of stretch marks. Nobody wants them, but they happen. 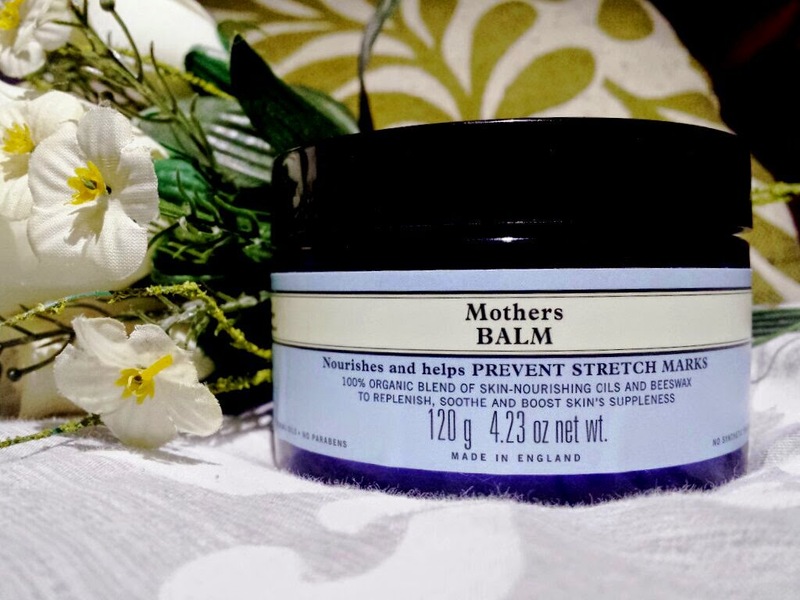 With that said, there is a huge point to stress - there isn’t actually any proof that creams can help to prevent stretch marks. They are mainly caused in pregnancy from rapid weight gain which is an inevitable aspect of being pregnant. Therefore, you are more likely to end up with stretch marks if you gain more weight than average throughout the pregnancy (which can be caused by carrying multiple children or a big baby, for example). Some say that genetics may play a role, but regardless of what is causing them, there is still no guarantee that the use of a bump butter will help you. Because of this, it becomes difficult for me to review the product in this area. 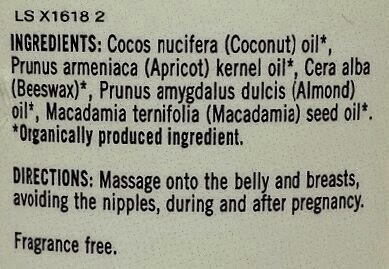 I can’t definitively state that it helps prevent stretch marks when there is no evidence that any cream actually helps. I am going to be reviewing this product by discussing the quality of it within other areas. I personally like bump butters because I find my skin to end up feeling quite uncomfortable and tight, especially as the bump gets larger. 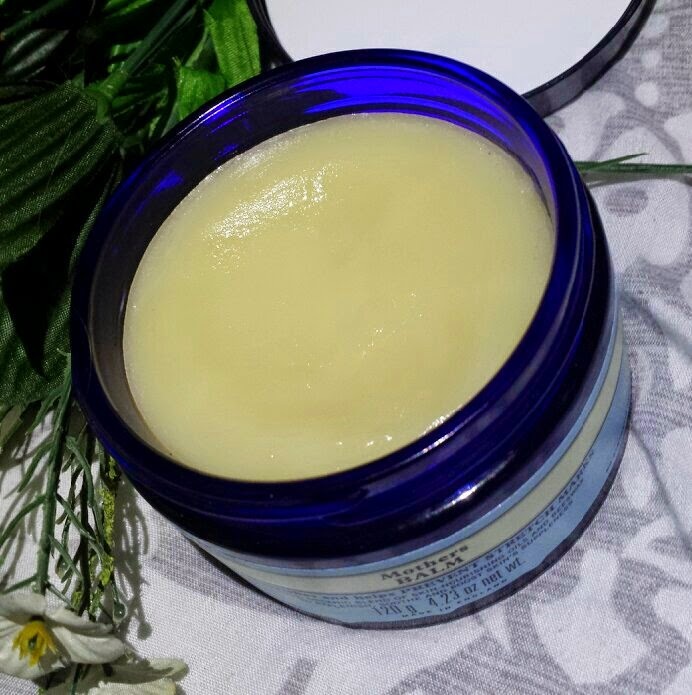 Skin can become quite itchy and dry, so a good bump butter for me just helps to solve those types of issues. I also like it to be safe for the baby. 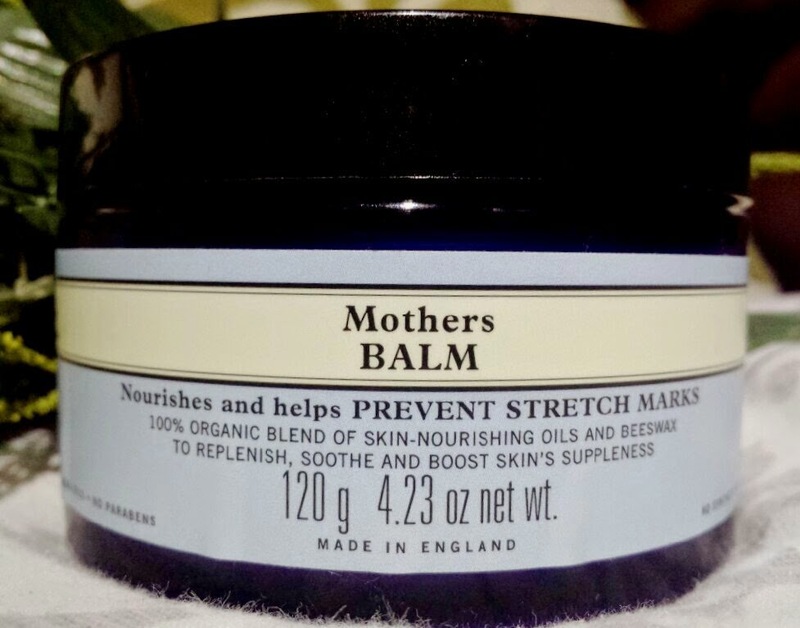 Mothers Balm from Neal’s Yard Remedies is a fantastic example of being safe. Made up of organic oils and beeswax, this butter avoids all the nasty bits that could cause potential harm. It comes packaged in a blue jar made of glass that holds 120g of product (side note: Neal’s Yard explain that they use blue glass as it helps to block sunlight from reaching the product, helping it to stay fresher for longer). 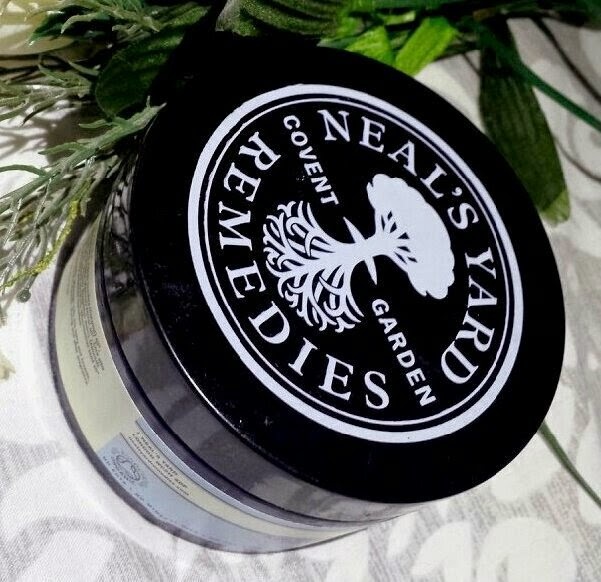 It has a dark screw lid that has the Neal’s Yard logo on it and a simple sticker around the jar itself with the product information. I think that it’s a rather stylish jar! It’s the exact type of packaging that I favour, but that’s just a personal opinion. The balm itself is a pale yellow in colour and at first sight looks quite hard (as it contains wax). However, once you touch it and warm it with your fingers, it melts very quickly and is simple to apply to your skin. The website states that you need to scoop some of the balm into your hands and allow to soften before applying it to your skin. You need to "spread evenly and gently massage into the skin” to help absorption. When your bump is quite small you won’t find yourself needing much at all, but the website does say that no more than a teaspoon should be needed to cover the area when your bump is a lot larger. I can’t ever really imagine needing that much though as I find that a little goes a long way! It is also best to begin use as your stomach begins to grow. I have been loving this balm so far! Not only is it keeping my stomach incredibly soft and comfortable as it is [slowly and only just] beginning to grow, but it feels luxurious as you apply it. Along with that, somewhere inside you feel really happy as you do use it because you know that it doesn’t contain any of the bad stuff. However, with all good things there are usually a couple of bad aspects. Once applied, it can leave a slightly greasy feeling. I find that this goes away as long as you continue to massage it in thoroughly or if you use a little less. It is an easy to solve problem. The main issue for me with this balm though is the smell. Whilst you can’t really smell it when it is applied to your stomach, you can occasionally catch a whiff during application. It is fragrance free, but the blend does have a slight sawdust/hamster cage type smell to it (I’m pretty sure it’s the beeswax, but I still can’t stop thinking hamster cage). It isn’t an issue once you have finished applying it and you only really smell it for a few seconds, but it is still there. I do plead that you don’t let that put you off though. If you are looking for a new bump butter than I highly recommend that you give this a go. It helps to soothe an itchy tummy, it helps to ease the discomfort as your stomach steadily begins to grow and it leaves your skin feeling deeply moisturised and that feeling lasts all day. I used a few different bump products during my first pregnancy and this so far is hands down the best that I have used. Where other products felt to me like normal moisturisers, this one feels far more pampering and a little bit special. I picked my jar up from John Lewis for £19.25 (where it wasn’t with the rest of the Neal’s Yard products but in the baby/maternity section instead), but it is also available from Neal’s Yard Remedies own website for £19.75. What is your favourite bump butter? Have you given this one a go before?